Rom graduated from the Royal Northern College of Music in 1973, where he studied piano and tuba, and has had a strong connection with brass bands ever since he started playing, at the age of twelve, with the Whitworth Vale and Healey Band. After music college, Rom joined Besses o’th’ Barn band on Solo Eb Bass during their very successful period under Roy Newsome. During this period (1977-1983) he gave one of the first public performances of Edward Gregson’s Tuba Concerto under the baton of the composer. Rom has also played as a guest with Black Dyke, Brighouse and Manchester CWS. 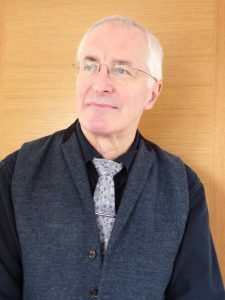 Rom has been a teacher for over 40 years, initially teaching music in various secondary schools, and latterly in various senior leadership roles. He was the first musical director at Wardle High School, a position he held for 12 years. During this time he directed the school band (Wardle High Youth Band) and achieved notable successes (including National Youth Band Champions, performances at the Schools’ Prom at the Royal Albert Hall, BBC programme “Brass Beat” with Roy Castle on Wardle High Youth Band, and Yorkshire TV “Brass in Concert” with Roy Newsome). After a brief spell as MD of the Championship section Stalybridge Band (1982-84) Rom moved to Hampshire as Divisional Head of the Hampshire Music Service. He has been an external examiner for Salford College of Technology, a guest speaker at the National Association for Brass Teachers (London / Manchester), guest tutor (tuba) for the Swiss National Youth Band, and guest tutor (tuba) on residential courses for the Wessex Brass Association. After retiring from full-time teaching in 2012, Rom joined the Easington Colliery Band (Championship Section) on euphonium then, on re-locating down to West Sussex in 2014, he joined the Horsham Borough Band on euphonium. We are extremely pleased that Rom has remained in Sussex and has chosen to join the Chichester City Band team!